So perfect is this moment, that I am almost prone to forget the horrors the little fecker has put me through during our last two public outings! 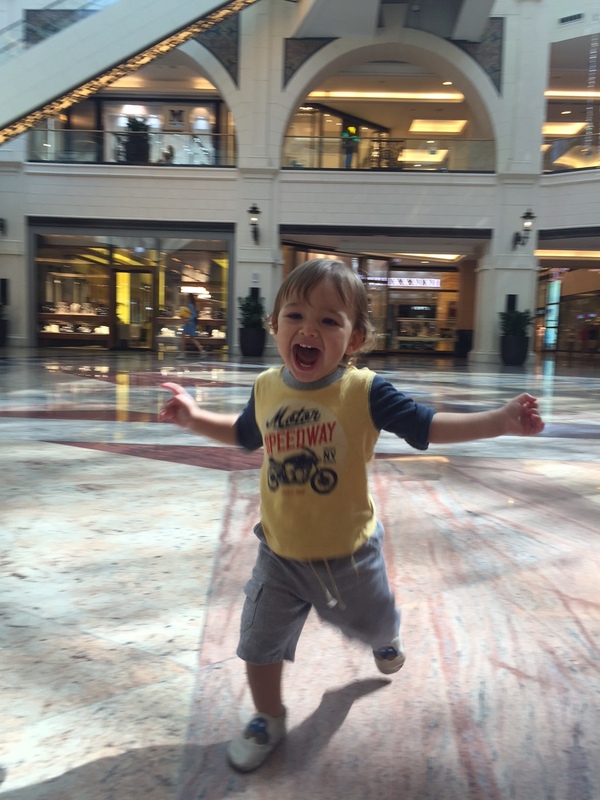 The first meltdown of the day (the one that set it all in motion) took place minutes after the little guy and I arrived at Dubai Mall. He was freshly napped, and I had a lovely little morning of breakfast and a play at Caboodle planned out for us. If you’ve been recently, you’ll have probably noticed the lovely Hamley’s banner advertisements hanging from the ceiling, complete with a giant fluffy teddy. It was here where I made the epic fail of pointing to said fluffy teddy. And oh my, did my son want it!! He wanted the teddy so much so that he reached with all his tiny might from our position on ground floor up to the teddy on the second floor. But hell hath no fury like a baby-tot denied its chosen teddy. A meltdown of all meltdowns ensued whereby I could not pick him up without him turning into a flailing red scream-monster. My attempt to strap him into the pram was pointless and attracted a lot of looks from passersby. My only power was my trusted baby-carrier (which he is rapidly outgrowing, god help me!) I managed, only just, to clip him in. He remained red and flailing, but at least he was bound to me, unable to escape. Taking refuge at Café Nero he calmed down somewhat. “Ah, he’s just hungry!” I thought to myself. Ten minutes later, after wolfing down a sandwich and drinking piping hot coffee, I thought it best to leave the establishment before we created anymore mess or attracted any more attention with our high-pitched squeals. The pram, again, was a tantrum-inducing no-no, and he had caught onto my evil carrier plan and resisted it with all of his tiny being. Attracting a lot of stares from passersby, I attempted to carry my wannabe escapee while pushing the empty pram – my soul goal in life to find Caboodle! Of course, the idiot that I am walked the whole way around Dubai Mall in search of the place before, to my dismay, I found it just round the corner from Café Nero! But hell hath no fury like a baby-tot forced to leave all its new-found toys! “Let’s go for lunch, have a play at Magic Planet, then do the weekly shop!” I declared brightly yesterday morning after discovering City Centre Me’aisem had opened down the road from us. My husband was with me this time. All should be fine, I thought to myself. Freshly napped and in good spirits, we all headed out. There were no high-chairs, so both husband and I tried (and failed) to hold the little guy on our knees. He had spotted Magic Planet, therefore any hope of him sitting nicely and eating some sandwich was dashed. ‘I Want To Break Free’ by Queen would have been apt backing music to play as husband and I took it in turns to retrieve him, before giving up and taking it in turns to let him sit in the car at Magic Planet. He was so happy and excited to be in the car that I really didn’t mind. His joy is so precious. That was until the excitement from all the escape-running got the better of him and he, to my complete shock and surprise, vomited absolutely everywhere! Everywhere!! Unsure what to do I called a member of staff over to assist while I tried to attract my husband’s attention…who conveniently had his back to me sat at Starbucks 100m away. Imagine my husband’s surprise then, when having been away perhaps all of four minutes, I return with a naked baby-tot! Wearing only his pampers I cleaned the little guy up. But then it was apparently play-time again! Waiting for my husband to return from assisting the site clean-up, I again attempted to keep hold of my noisy, naked baby-tot as people stared and children pointed! It was one of those laugh or cry situations – luckily I was able to laugh this time since I had backup. If alone with a publicly naked wannabe-escapee baby-tot, I may well have cried! Silly us had forgotten to bring the nappy bag, so off we went to Mothercare to buy our son a new outfit. Once dressed, we let our little bundle of energy run wild in soft play while we took a moment to chill. A good hour later, he was weary and tired, so we decided to do a quick dash around the shops before heading home. I placed the little guy in the trolley seat, only for him to immediately climb out (because, you know, he likes to terrify me like that). He sat nicely for a while within the trolley itself. But then of all the things I placed in the trolley, what captured his fascination the most was a pack of mincemeat, ew! A mammoth meltdown ensued upon removing it from his grasp, but much like the Dubai Mall teddy bear, nothing else would do – he wanted the mincemeat! The rest of the shopping trip was swiftly abandoned and we headed to the till to pay and leave. Snuggles seem to have a somewhat magical capability to melt away stress and anger and worry, don’t they? They fill you with that deep, all-consuming love – the kind of love that you can only understand if you’re a parent. How do our babies have this power over us? How can they bring us to tears with stress one second, then bring us to tears with love the next? How can they simultaneously be so naughty, yet so so ridiculously beautiful? How can they make you feel like parenting is the hardest thing you have ever done, yet at the same time make you feel like it’s the most perfectly natural thing in the world? How is it that I desperately want to take my son to play outside of the house, but quite honestly never want to venture out again? My perfect little boy, I love you more than anything else in this whole wide world, but wow you’ve given me a glimpse of how ill-prepared I am for the toddler years… I best buckle up! I’ve seen those other mums in malls in Dubai with toddlers sat peacefully in a pram while mum is loaded down with bags from fashion and shoe stores. I have always looked at them in bewilderment as my outings with toddlers were always just like these you have described. My theory is that they are drugging them! Happy not alone! Tears of joy and tears of stress… I only see toddlers that sit in highchairs and eat quietly their meal and let their parents enjoy, while busy with a toy. When with us, even at home it’s a hard messy mission. Oh well yes sometimes I’d rather stay at home. Good to read that it gets easier.